We began here simply because Against the Cult of the Reptile God is set in Hochoch and the areas north of the Rushmoors. But the longer we played in those scant locations, the more I wanted to explore the Oytwood and the Dim Forest. I mean, what cool names! And the more you read in the Setting box, you learn some pretty exciting fluff about those areas too. Here’s my point: by starting with a robust map, there are practically infinite story hooks available. So when we concluded Reptile God, I started writing a brief travel adventure down the Javan River. I was thinking 2 parts Davy Crockett and the River Pirates and 1 part Ken Burns Civil War documentary. Our players joined a crew of fifty-two people conscripted to guide and guard a small fleet of barges down the river to Flen, where they would be picking up a load of granite and sandstone. Our PCs in particular were hired as bodyguards for the patrons of the quest. I’ll get to what I learned from that homebrew adventure in an upcoming blog. But what have I learned from using Darlene’s map as the basis for my campaign (which will be continuing in two week further down the Javan River)? Maybe this over-generalization is only true of my own settings. World-building is not one of my strengths [total aside: the 5e DMG is the best book I’ve ever read on world-building. Every DM should buy it and read it]. After a while, the towns and NPCs all start to look the same. Maybe they wear different clothes or the skin of a different species, but there isn’t much different going on. By using a map, I’m forced to think local and to slow down. In AD&D, it takes about 24 hours to cross a hex on foot. Sometimes, you want to handwave the journey just to get players where they’re going. But on the other hand, there can be some very valuable roleplaying, character development, and group synergy developed during those times. When traveling, I’ll usually give players an idea of what they’ll experience in a day and ask if players want to do anything special. If I get the vibe they want to just move on to the action, we’ll go for it. But if they want to explore a bit, I’ll let them do so. As it turns out, you do have players who enjoy the exploration aspect of D&D. So give them the opportunity! By slowing down the pace and taking in the scenery, players get a better feel for the environment. It adds a depth to the setting that wasn’t there before. And I think it paints a better picture in the mind that will help players remember these stories for years to come. In preparation for these travel scenes, I actually do roll random encounters. But I do it ahead of time, so that I’m able to contextualize the encounter, so that it doesn’t seem completely random. I personally love the AD&D random encounter tables (not to mention the 5e ones)! These travel times are a great time to wield those. My players have met dragons, treants, and water goblins due to those tables. They’ve endured harrowing encounters against giant owls and giant turtles. And, for the record, I’ve never had a character perish in a random encounter. I don’t pull my punches, but I’m careful to make sure there are ways to succeed that aren’t necessarily combat. Because let’s be honest, 1st-level characters from Hommlet can’t kill dragons successfully. So the dragon wasn’t there for blood–he wanted to steal our magic-user’s spellbook. Some randomly-encountered giant cranes weren’t stricken with inalienable bloodlust–they were protecting their young. There are ways to make random encounters logical and natural, while still challenging to the players. It just takes a little extra thought. I’m still not great at world-building. But I’m learning that most modules can be retro-fitted to other locations. Heck, The Tomb of Horrors has several options for its location. There’s no need to reinvent the wheel, unless you really want to! So I’ve been liberally moving modules around to suit my needs. In roleplaying there is no “canon,” except the canon that you establish. So move stuff around! Eventually, I want to get back to the Oytwood and the Dim Forest. Maybe it’ll be another module. Or maybe I’ll go homebrew again. 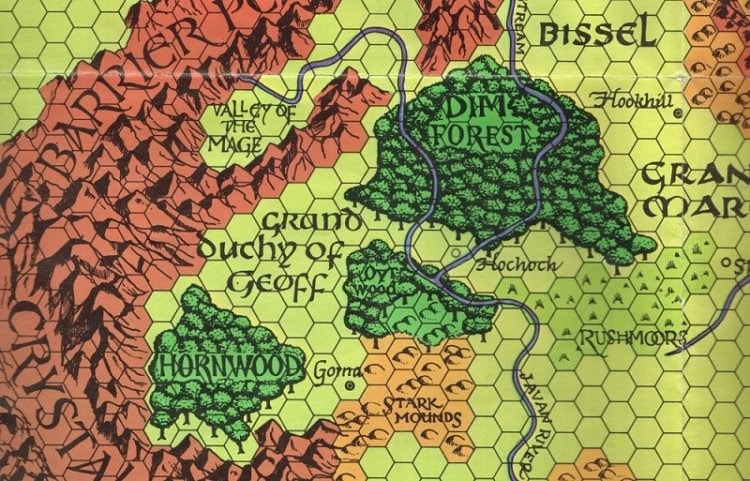 What I do know is that I don’t plan to depart from the Greyhawk map anytime soon in my AD&D group. There’s just too much that I want to explore in that world. I’m sure I’ll get tired of it in time, but the good news is…there are more maps to choose from! So which map are you going to start with next? Or maybe you’re already using one? Sound off in our comments below or on Twitter! 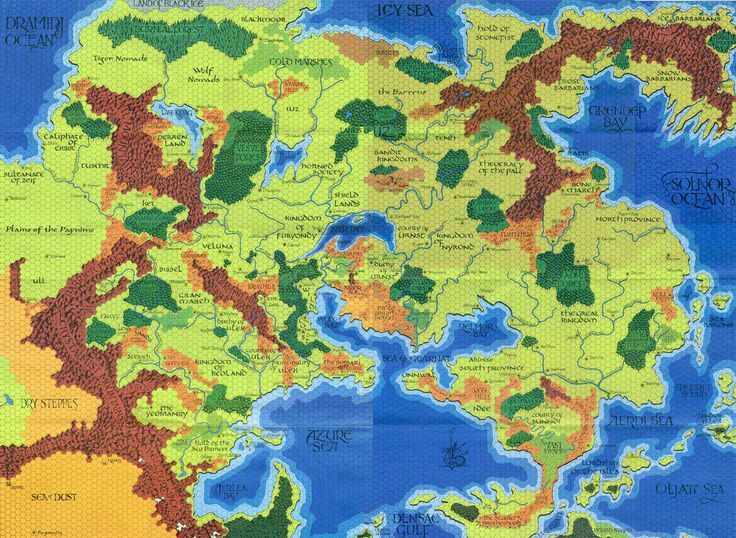 I’ve also been running my 5E Greyhawk Campaign here for the last three years. Here’s the map I made that kept the gang busy for levels 1-8, now they’re off galavanting through G123D123Q1!